You’ll find well-cooked, honest, uncomplicated but imaginative food. Our team of chefs, led by Andy Hilton, are passionate about sourcing both classic and new ingredients straight from the farm gate and fresh off the trawlers. Our restaurant is open all day for relaxed dining in peaceful surroundings, perfect for the “Ladies who Lunch”, or for that all-important business lunch. The Green House bar serves pastries and snacks from 10 am – 10 pm, including our gorgeous Afternoon Tea which is made fresh to order by our onsite pastry chef, James. For dinner, Arbor features our seasonal A la Carte menu, which commences at 7 pm. If you are an early bird or you are looking for a pre-theatre bite then dine from 5 pm – 6:30 pm; 3 courses for just £25.00. We also have an events team who are passionate about making your “get together” the most memorable and delicious experience you and your guests have had to date! If you’re planning an event, perhaps a baby shower afternoon tea, a christening party, or a birthday lunch, contact us for more information. We can also offer private dining if you require. Rated 4.5 / 5 based on 531 reviews. 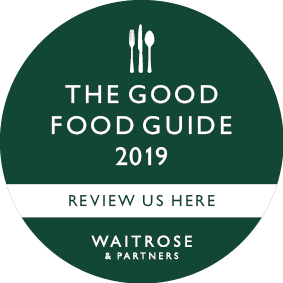 The Good Food Guide 2019 comes out in September and you can vote for us to be included via the link in the above logo. We would really appreciate your support and every vote really does count!